I finally found time to see this for the first time last night. Life has been so hectic recently, and we've both been so tired, that we've been unable to watch any film over about 2 hours (except, somewhat bizarrely for the tedious King Kong). There are a few comments below on the original version of this story the 1907 Ben Hur , but at 15 minutes it is really only highlights from the story, rather than the story itself. Firstly, the restorers of this film have done a great job. Most of the silent films I have watched have been poor VHS copies, accompanied by a dull organ soundtrack, which only serves to emphasise the time that has elapsed since the film was first produced. The soundtrack here is overall very good, the use of sound effects correlating to the story (e.g. the beating of the galley slaves' drum, trumpets in processions) is excellent. The one scene where it didn't really work for me was the chariot scene, but other than that it was excellent. In addition to this, the film was one of the first to use colour footage. The earliest films introduced artificial colour for example The Life and Passion of Jesus Christ has coloured in the film stock on specific items in the shot, in specific scenes. Another technique used in that film and also others such as From the Manger to the Cross is the use of colour filters. It wasn't until the twenties that the first 2-strip technicolour technology started to be used. Cecil B. DeMille used the technique sparingly in both his 1923 version of The Ten Commandments and his 1927 The King of Kings. Sadly, I only have these films on VHS and the un-re-mastered colour looks very weak indeed. Here, the colour was shockingly vivid when it was used. Although, like the above DeMille's films, the vast majority of the film is in black and white, colour film was used far more frequently in this film - and noticeably for the scenes featuring Jesus. Conversely, for the sentencing of Jesus and his walk to the cross the film reverts to black and white as if to highlight the event's somberness. I've read before that this film is far more Christian than than the 1959 version readers will be most familiar with. I think this is largely true - in addition to the use of colour for Jesus' scenes, there are far more scenes from his life, and the relevant gospel is cited on the intertitles when appropriate. In addition (Spoilers), the scene where Judah's mother and sister are healed takes place on the road to the cross, rather than at a distance during the crucifixion. Hence in this version this is clearly Jesus working a miracle, rather than some supernatural working from a less specific God. A few other points I'd like to make. Secondly, given the controversy over The Passion of the Christ, it's noticeable how this film deals with some of the potential anti-Semitic elements of the story. So at the start Judah wears a skull cap to emphasise our hero's Jewishness. The three wise man, in this version tell us where they come from, and rather than being simply "the east" as Matthew's gospel tells us, they are from 3 different continents - one is a Greek, one is an Egyptian and one is a Hindu - racially diverse as well as geographically. Finally it was very noticeable that when Pilate blames "the mob" for Jesus's death, the mob identifies itself as being from many nations - so avoiding placing the blame on "the Jews" alone. Thirdly, the character of Joseph is notable both for his age (both compared to Mary and in general), and what seems to be his appearance in the cup of water scene. Shades of the Jesus mini-series (1999), the only other film I can recall which shows Joseph once Jesus is an adult, where Joseph's death is the catalyst for the start of Jesus' ministry. There were a few of low point for me however. One is the scene between Judah, Simonides, Esther and Masala's Egyptian mistress which really dragged, particularly as I knew the chariot scene was up next. I also couldn't help but be distracted during the sea battle scene, knowing that some of the extras actually did die during it's filming. Also distracting was the last supper scene. Unfortunately all the creativity for the scene went into working out how to hide Jesus's face, and as a result we're left with a very dull reproduction of Da Vinci's painting, which strangely had a sort of cartoonish feel to it. Lastly the ending line seemed like a bit of a let down. I haven't read the book (which I suspect those of you who have will have already guessed), but I would be surprised if the closing line in this film is taken from the book given that it has a rather Bultmann-esque ring to it. Overall though, it's an incredibly impressive film. Amongst the crew members for the film was one William Wyler, who went on to direct the record-breaking 1959 version. It's clear watching this film that it was highly influential on Wyler. Both films, for example, combine an epic scope with intimacy between the characters. 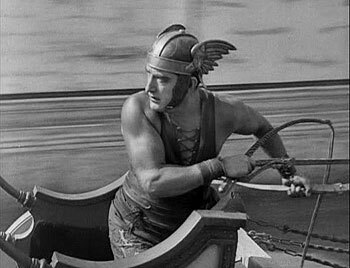 Many scenes in the later scenes are derived from this film, such as the chariot race (which Wyler worked on), although no doubt some of this is due to the common source material. 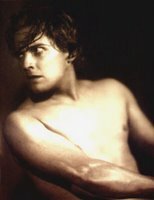 Director - Fred Niblo; Judah Ben Hur - Ramon Novarro; Messala - Francis X. Bushman; Screenplay by June Mathis based on Lew Wallace's novel. Just found your site and it looks very interesting. I've highlighted it on my blog. Hope you keep going! Glad you found the site, and I hope you enjoy it. I look forward to hearing more from you. "The Robe" (1952) we can see the same scene reworked. Why is that?